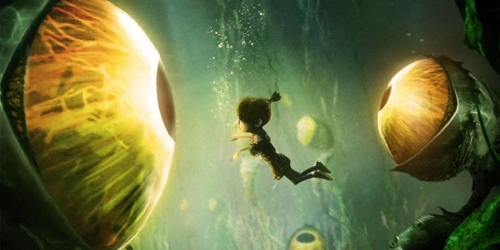 Several years ago, the Portland-based animation company Laika Entertainment emerged on the scene with the dazzling Coraline, a stop-motion journey into a mythical world adapted from the works of Neil Gaiman. Filled with dark whimsy and meaningful allegory, the Henry Selick-directed story put the animation studio on the map with its hypnotic, outlandish fusion of reality and nightmarish fantasy. Since then, the studio has been chasing after that same kind of artistic success, yet their following works -- ParaNorman and The Boxtrolls -- have been jaw-dropping works of visual creativity that lack the kind of substance that made their introductory work such a memorable experience. When Kubo and the Two Strings came crashing onto the scene with its Japanese-inspired setting, fairytale trappings, and symbolic storytelling centered on a child's voyage amid hardship, it appeared as if Laika might've rediscovered the same type of haunting magic that filled their first feature, and that turned out to be right. This is a stunning, quite memorable piece of artistry. Positioned on the very edge of a seaside village in the midst of its rocky terrain, a young, half-blind boy named Kubo ekes out a meager existence with his ill mother, exposed to little of his enigmatic past. To make money, Kubo -- earnestly voiced by Game of Thrones' Art Parkinson -- tells stories, plucking the strings of his guitar while his secret magical abilities give shape to slips of paper, creating origami displays that lend visuals to his thrilling adventures. In the rare moments his mother comes out of her despondent stupor, she warns him of the nighttime: the threat that might come and whisk him away to see his evil grandfather, if he's not careful. Circumstances force Kubo to face the reality of this threat, sending him on a far-away search to locate the magical pieces of armor worn by his father, the great samurai who died trying to save his child's other eye. With the help of a talking monkey (Charlize Theron) and a beetle-like warrior (Matthew McConaughey), Kubo travels far and wide across all sorts of terrains, while discovering the extent of his magical ability in the process. A breathtaking, unmistakably Eastern-oriented setting surrounds Kubo and the Two Strings, with waves that violently crash upon rocks protruding from the water, somber rice dinners over candlelight, and delicately sun-covered scenes of a young boy entertaining a crowd of villagers with his stories. Before Laika enters the comfort zone of their fantasy realms, they build up a splendidly detailed and involving reality out of Kubo's quaint residence, steeped in cultural legends and reflective on loved ones who've passed on. Flickers of magical elements can be found early in Kubo's story, notably around his ability to manipulate paper with his gifted guitar-plucking, and it's easy to get caught up in even those minor doses of wizardry concocted by the stop-motion animation. This is secondary to the dramatic essence created through Kubo's saddening-yet-hopeful interactions with his mother and the work he puts into feeding the pair of them, which taps into an honest and solemn depiction of coping with dementia and illness, strengthening the young boy's character in the process. By lingering on this dramatic intimacy at the beginning, Kubo and the Two Strings builds a rock-solid foundation for the outlandish adventure that's to come for the young boy ... and what an adventure it becomes. From frigid, snowy expanses and subterranean caverns to the volatile peaks and depths of the ocean, the search for his family's armor leads Kubo and his companions -- guardians, more like -- far and wide across this mythical realm. 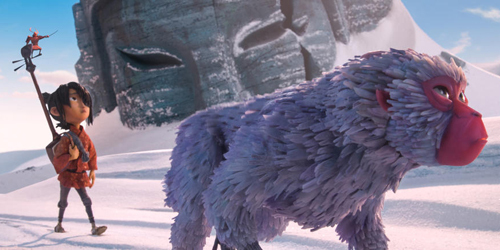 Along the way, Kubo discovers more about the magical abilities that he's inherited and how it can be used against the obstacles thrown at him, brought to life through Laika's endlessly creative and mesmerizingly detailed craftsmanship. The life they conjure within Kubo's surroundings is staggering, with environments full of expansive scope and harrowing intensity, bequeathing the journey with deep-rooted, textured authenticity that never leaves one without something to marvel at. These things build toward thrilling action sequences, whose vigor rivals that of most of the summer's blockbusters, never shying away from the scale of colossal beasts, nimble villains, and grandiose enchantments. 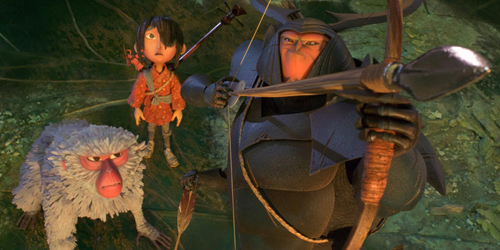 The true power of Kubo and the Two Strings lies in the characters, though, both the personalities themselves and the ways in which they interweave with the film's meaningful intentions. They work so well because of the synergy Laika generates between the phenomenal voice cast and the incredible expressiveness of the stop-motion animation's faces, whether we're talking about how Charlize Theron's voice disappears in the protective, hesitantly quirky responses of Monkey or Matthew McConaughey's recognizable but entirely charming presence as the affable Beetle. During the safe stretches of their journey, the warmth of their emotions radiates alongside the script's poignant desires. Amidst the dangers of battle against their foes -- notably the pitch-perfect shrill vocals from Rooney Mara as Kubo's spectral Aunts, manifesting into one of the year's best villains -- the evolving, fraught looks on their faces draw one deeper and deeper into the profoundness of Kubo's trials. Just on the surface, Kubo and the Two Strings ties together the enduring bonds between family, the discovery of one's deeper gifts, and the enormity of loss into this brisk, emotive fantasy that wastes very little precious time in its 100-minute span. Dazzling martial-arts battles mix together with methodical, yet brisk pacing and Laika's bravely bittersweet inclinations to take their stories into melancholy territory, ever driven by the striking sounds of Kubo's guitar ringing in the air. All this mounts into a rewarding quest for the young boy that distills folklore and allegory into a powerful tale, one that continues to peel away layers throughout involving the significance of memory and moving forward no matter what. Kubo urges the audience not to blink while observing this story, and the way Laika's built this beautiful masterwork leaves absolutely no reason to do so, all the way until the film's heart-rending reveal of the significance of those two strings.